I cannot wait until my girl starts reading books to herself, as I was always an avid reader. I can immerse myself in books and want my own library at home (that's a dream of mine). She loves a story and is interested in knowing what is going on in a story. I'll be quick to read The Magic Faraway Tree among others, it really reminds me of my childhood. 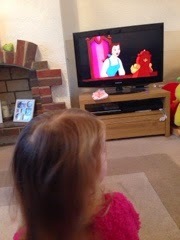 I've already started to introduce her to Disney films that I love. My all time favourite is Beauty and the Beast, I know all the words to all the songs. Do you want me to sing it now? No! Oh ok!! 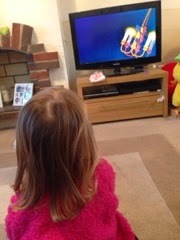 My girl sat transfixed by the film and we watched it twice in the same day. I'm so glad she loves it as much as me, it's magical to watch her sitting wide eyed and it makes it all more special. Guess that's the magic of Disney. Recently she's got into all the latest Disney films so it's good to go skittle bit retro and show her one I love too. Now I can't wait until she's older and I can initiate her into the world of the 80's classics. Films such as The Breakfast Club, Pretty in Pink and Dirty Dancing. By then they will be called vintage classics and I'll really be showing my age.